Whether you’re thinking of switching to wood pellets to save money on your heating bill, to reduce your carbon footprint, or to support our domestic economy, you’re doing your part to invest in a better, greener future! Tell us why you switched to wood pellets below! Why pick up your pellets, when we’ll deliver them to your door? Sometimes we hear from our customers that they’d rather pick up their pellets and haul them home themselves. Now, we’re all about a good workout… but we’d much rather be burning through some rolling hills on a road bike than schlepping bags of pellets from the store to the truck to the basement. If you’re of a similar mindset, break out that bike, and we’ll take care of the heavy lifting for you! All of our delivery trucks are equipped with a forklift, so we can move whole skids off the truck and onto your driveway, leaving the weather-resistant packaging in tact. And if you need more precise placement, don’t worry – we offer pallet jack service in many areas. Our driver will use the jack to move your pallets into your garage or over any hard, flat surface, so your pellets are placed exactly where you want them. 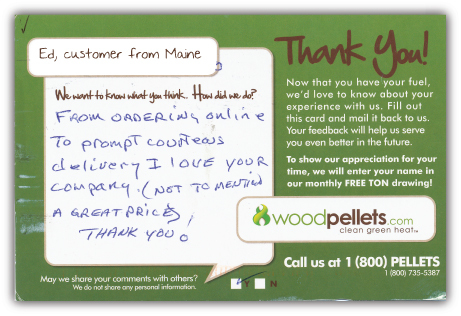 Check out this video to see what our customers have to say about their delivery from WoodPellets.com. And if you’d like to join the conversation, leave your comments below!